This is the story of Shireda Thorpe. As a youth, Shireda Thorpe craved attention. One sure fire way to get attention, she realized, was to do things that got her into trouble. Her actions were a cry for help that went unrecognized. For years she acted out on this negative energy. It was all she knew, and it caused a great deal of pain and trouble in her life. She seemed to be running from something, but she didn’t know what that something was. As a teenager, she was diagnosed with bipolar disorder. That solved some of the confusion. Soon after, however, she connected with The Attic Youth Center, Philadelphia’s only independent Lesbian, Gay, Bisexual, Transgender and Questioning (LGBTQ) youth center. At The Attic, Shireda found a community that supported her, and she was able to see a different path for her future. 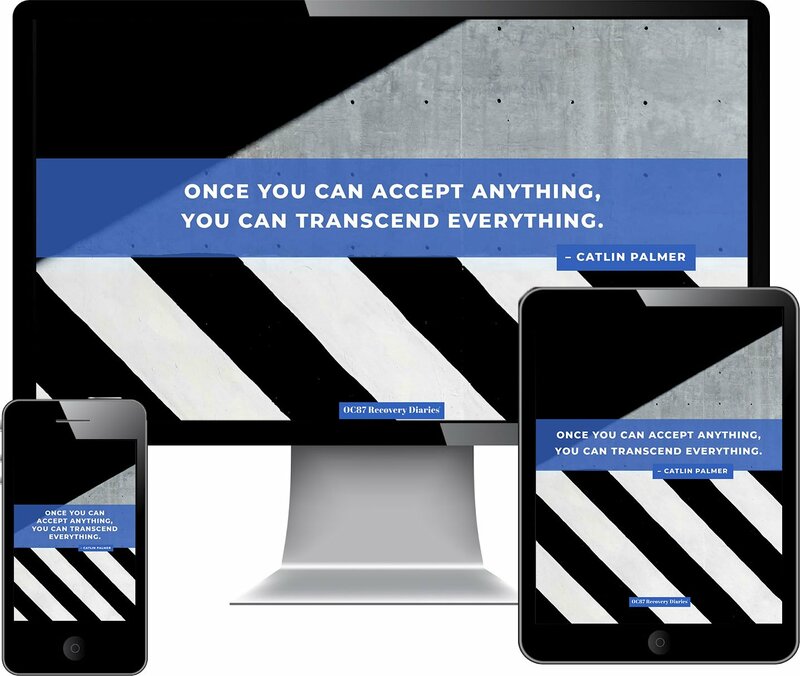 She came out of the closet, and began building her life anew — a strong, resilient lesbian who shares a message of acceptance and hope. In Sherida’s life, anger and resentment was overcome by love, support and endurance. Today, Shireda receives support from the Wellness Alliance at Horizon House in Philadelphia. Since 1952, Horizon House has been a resource in the Philadelphia community for adults with psychiatric or developmental disabilities, drug and alcohol addictions and who may experience homelessness as a result of these complicated challenges. The Wellness Alliance, part of Horizon House, is a community-integrated service founded on the concepts of choice and self-determination, and guided by the principles of psycho-social rehabilitation and recovery. The Alliance strives to empower program members like Shireda to establish or re-establish roles in the community, develop personal support networks, and improve their overall quality of life. Shireda’s journey is one from confusion, chaos and crisis to a place of clarity and confidence. We are proud to share her story. 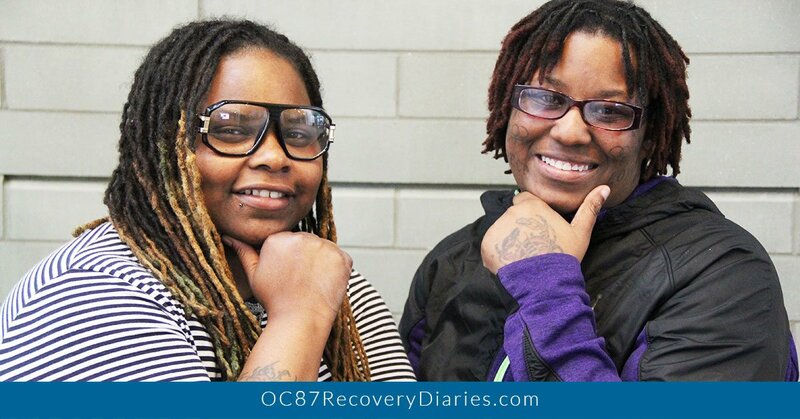 To create this OC87 Recovery Diary, Shireda was assisted by Priscilla Jessie from Horizon House. Jane Swanson and Helene Roberson (also from Horizon House) were an important part of the team. Shireda’s Story is part of an ongoing series of short films by first-time filmmakers that detail journeys of recovery and transformation. 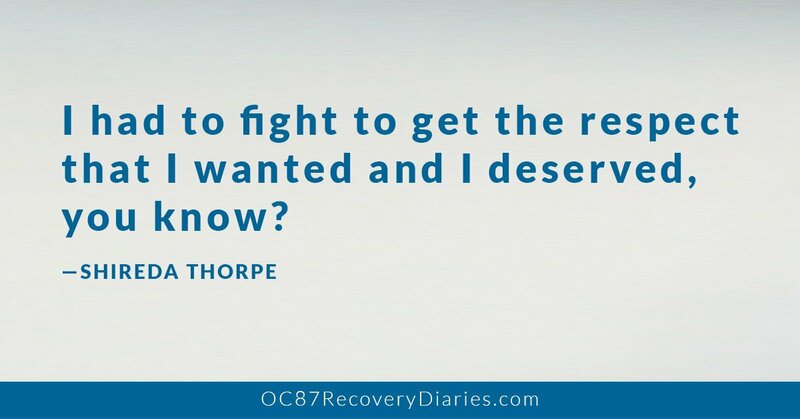 The films are a collaboration between OC87 Recovery Diaries and Philadelphia public television station WHYY. First-time filmmakers from area mental health and wellness organizations are in charge of shooting, editing and structuring their video, with support and guidance from experienced producers. My name is Shireda Thorpe, born and raised in West Philly. The middle child. I have two sisters and a brother, so there’s four of us. I was always energetic growing up, very fun, laid back. A friendly type of person. Very well liked. My parents passed away in 1994 and 1997. It put me in a dark place. Nowhere to turn. It made me feel left alone. My lifestyle — I’m a lesbian, part of the LGBT community. I was always confused growing up. Back then I was considered a tomboy, but people was telling me I was gay. I’m not sure if I was, but by people telling me, it kind of messed my head up a little bit. I was different, you know, but as I got older, it just got worse for me. When I was twelve years old, I was arrested and placed in the Youth Study Center for four months for misbehavior in school. I gave my parents a hard way to go growing up — juvenile homes, detention homes, I turned their screws, you know? I was being rebellious, not having respect for authority. I didn’t get much respect when I was younger, you know what I’m saying? I had to fight to get the respect that I wanted and I deserved, you know? When I was thirteen years old, I was admitted into a psychiatric center in Virginia, where I was diagnosed with bipolar depression. I have a nephew that suffers from bipolar depression. A lot of my family members suffer. I had an aunt who committed suicide from being depressed. So it is brought down from one generation to the next generation. So, my nephew suffers from it now, constantly in and out of lock ups. When I came home from being locked up in a psychiatric center when I was sixteen years old, I found my way to The Attic Youth Center, where counselors and staff members there helped me define my identity. They helped me come out of the closet and helped me define my lifestyle, because at one point I didn’t know who I was. I was kind of lost and confused and my sexuality was a big part of me. Once I started going to The Attic, with more people like myself that were also lesbian, gay, you know, transgender, they helped me define who I am and they helped me to better myself and get comfortable with my lifestyle. Without them, I wouldn’t have come out of the closet and I wouldn’t have felt comfortable with myself, you know what I’m saying? Because people were gay bashing, making me feel less than what I am. Making me feel like I ain’t nobody. But they (The Attic) definitely were there for me. Since 2011, I have been attending programs at Wellness Alliance, where I participate in group therapy, learn life skills, and receive treatment for bipolar depression. Wellness Alliance helped me a lot. I came a long way with them. When I first started in 2011, I was still a lot angrier then than I am now. I wasn’t taking my medicine frequently, I was constantly getting into trouble, wanted to fight people, not caring what people say to me – having a negative response to everything that people would say to me. They helped me manage my diabetes, helping me lose weight. I have a gym trainer who works with me frequently. They helped me with cooking, so that’s going well. Just having hope. Don’t give up. Don’t let negativity get in the way. Or change you from being the person you are.